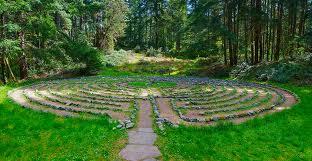 On Friday morning, I walked the labyrinth at Whidbey Institute in celebration of my friend Evan’s thirteenth birthday. I will never forget you, I will never forsake you. What I remember most vividly about that dance was facing total strangers palm to palm for the lines “I will never forget you…” Less a promise about not forgetting each other, it was a reminder to not forget ourselves. This week, as I walked deeper into the labyrinth, I thought about that promise and about the significance of adolescence. I was curious as to how they were related. Circling out again brought the answer. I remembered Vallombrosa. I first heard the mourning doves at Vallombrosa. It was my habit during the weeklong workshop with Ira Progoff to rise very early and walk the winding, oak lined streets of Menlo Park. The song of the doves was unfamiliar, yet soothing and so I asked about it. When I heard the bird’s name, I assumed it was morning doves. But as my work in the Journal Process continued and touched, for the first time in fifteen years, the grief of losing my parents , the birds became a symbol of my opening. I had never before experienced the wonder of having a deeply personal transformation in the company of others. Nobody “jumped down my well” as Ira called it, and yet I felt held by the group, safe in my new vulnerable place. I was in the adolescent stage of my spirituality, leaving behind a childhood pattern of emotional isolation and choosing connection. Like Evan’s “tweenage” shift, I was not yet into my mature heart, but I was on my way. Revisiting my Vallombrosa days during the labyrinth walk, I felt a longing to return to that place. To be back in that time again. And I saw that my life has had many adolescences… those leaping off places of leaving the old behind… of embracing the unknown and future self. They all share that desire to go back again in tension with the equally strong desire to move forward. But once the threshold has been crossed, I can’t recreate the childhoods. I can only carry forward some token of remembrance, some touchstone to help me remember. The circle dance with the Levines recreated my connection at Vallombrosa. The labyrinth did it again. Dancing the circle, walking the circle reminded me of how rituals can bring back a sense of numinosity to my busy life. To all of my betweens. Rituals link the past to the future and create a sense of continuity. They become the bridge between my childhoods and my adulthoods. They make adolescence less awkward. And I thank Evan for inviting me into his transformation and helping me to remember. How many adolescences in your life can you name? Are you in one now? What rituals help ground your during your “tweens”? Beautiful reflection…thank you. I am in “tween” right now and feeling both the joys and anticipation of what’s ahead and the growing pains of stretching out and opening further…into the unknown and the next phase of life..here’s to adolescence for Evan and for all of us! Do you think we ever get in shape enough from stretching that change becomes easier?? I really love this part … “And I saw that my life has had many adolescences… those leaping off places of leaving the old behind… of embracing the unknown and future self.” The dance between old and new, past and future … it’s a beautiful thing. Thank you for sharing your soul Jeanne – it takes such great courage! Thank you, Emily. I am inspired by your courage in taking the leap to live abroad and also excited to know about your new blog. I look forward to reading your new adventure tales!